Introducing Kellogg's second most boring Pop-Tart. The concept is interesting. Imagine the chocolaty soft cookie outsides and smooth vanilla inside of an ice cream sandwich. Sounds delicious, right? Now, remove 3/4 of the flavor and toast it. If there were such things as "a general brown flavor" and "a plain white flavor," this Pop-Tart may have gotten it right. Unfortunately, the flavors of muted chocolate and barely noticeable vanilla just don't work. The truly sad fact is that an actual ice cream sandwich (from Fat Boy Ice Cream) has only 7 grams more sugar and 30 more calories. The ice cream sandwich actually provides twice as much protein. If you're looking for a better Pop-Tart, I recommend closing your eyes and randomly reaching for any other variety of Kellogg's Pop-Tarts. I tried these Pop-Tarts toasted, plain and even frozen. For the best results, toast according to the directions and then let the pastry sit until it's just slightly warmer than room temperature. At this point, the filling has somewhat of a toasted marshmallow flavor. 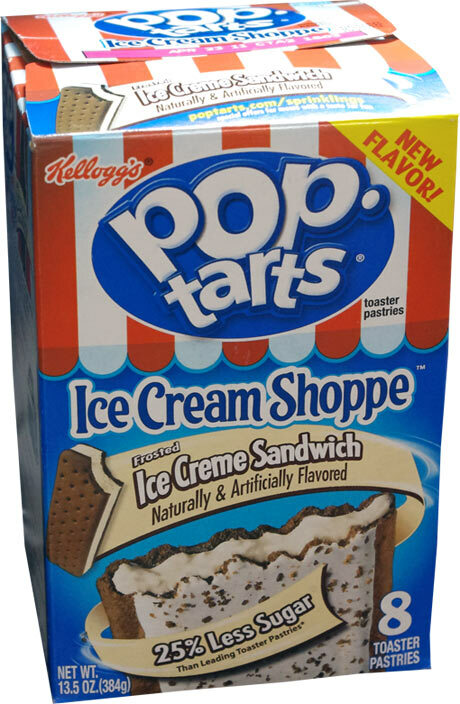 What do you think of Ice Creme Sandwich Pop-Tarts? I was REALLY disappointed when Kelloggs' dropped my favorite FROSTED VANILLA CREME poptars; I think this is a 'reincarnated' product box-wise. Unfortunately, it doesn't measure up. The amount and quality of the actual vanilla creme has lessened. I don't mind eating them, but they don't stand out on the ice cream sandwich flavor. It's more of a chocolate crust with sugary filling to me. Not bad! These are exactly the same as the old chocolate-vanilla creme pop-tart! Sadly, look at a box of the old ones, they didn't even change the look of the "new" poptart. I love them! And since there's less sugar, less guilt. Great late night snack. Ewwwww!! Who would even eat this thing. It is a rip off of the real thing! They do not taste like the chocolate vanilla creme one. I miss those pop tarts!! 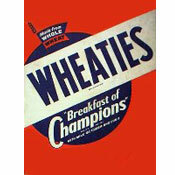 I have eaten them for years. I want them to make those pop tarts again. The reduced sugar Pop-Tarts aren't any good. The crust tastes different and there isn't as much filling. The Cookies n Creme ones are way better, and the Hot Fudge Sundae ones were way better before they reduced the sugar in them also. These also taste nothing like an ice cream sandwich. Seems like this particular Pop-Tart was just a way of rebranding the discontinued Chocolate Vanilla Creme Pop-Tart that everyone complained about being discontinued. 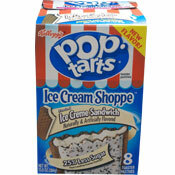 Ice Cream Sandwich Pop Tarts are very yummy... tastes like vanilla fudge ones they sold a few years ago.